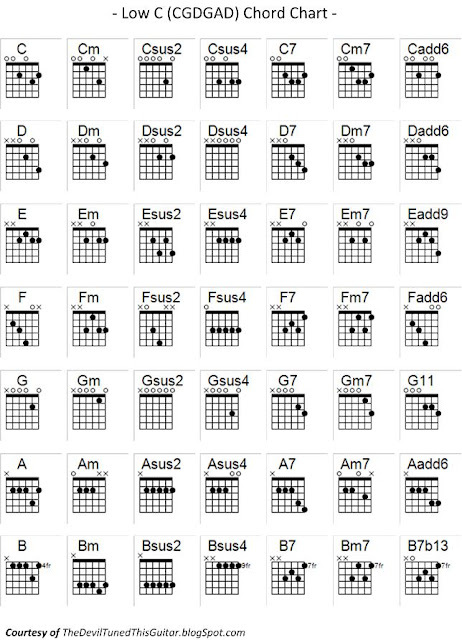 A favorite of Celtic finger style guitarist El McMeen, Low C Tuning was originated by an English guitarist by the name of Dave Evans, purportedly as a variation of a common Hawaiian tuning, CGCGAD. 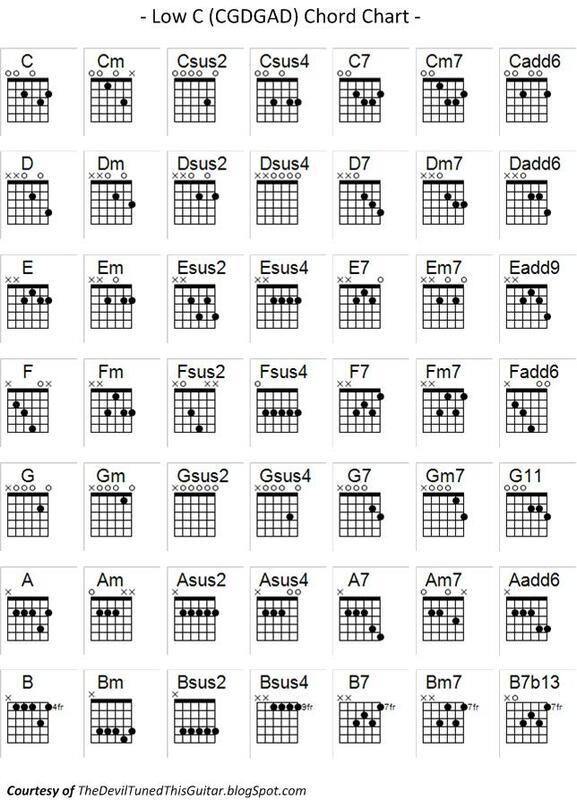 In essence, this is a bastardization of Open G tuning, with the first five strings ringing a G suspended 2nd chord. The sixth string, normally the fifth of the open tuning, is tuned down an extra whole step to C. The result is an added 11th in the bass. The vaguely Celtic feel of the tuning is reminiscent of the more common DADGAD, or Dsus4, tuning. Starting in the bass, the two lowest strings are tuned to perfect fifths, C to G and G to D, respectively. Next is a perfect fourth from D back to G, and then the common anomaly of open tunings, the perfect second from G to A. We finish off with another perfect fourth, from A to D. These intervals allow for fairly accessible chord shapes and scales that don't require too much jumping around. 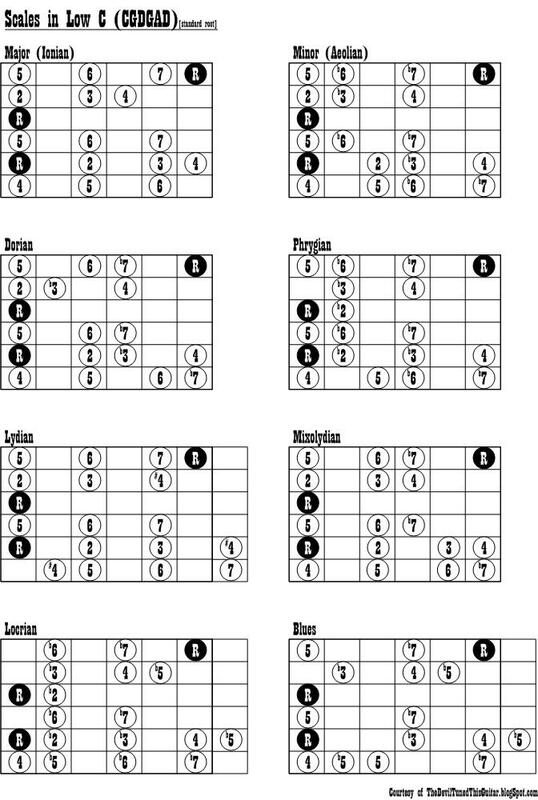 The following image shows common chord shapes in Low C tuning. I've made two sets of scale charts here, the first is from "standard" position, or starting with the root on the fifth string, as one might do for Open G or Open A. The second has the root in the "bass," or starting on the sixth string. 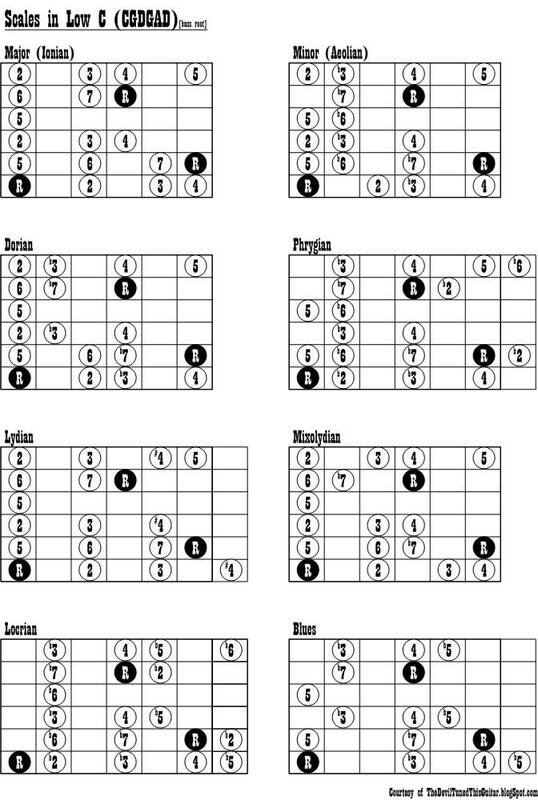 This gives an array of scale options for this versatile tuning.